I’m going to be doing a presentation to mothers of preschoolers later this month. This has caused me to spend time thinking about what kids eat. It has always bugged me that we create foods for our children that are absolutely the worst things they should be eating, then wonder why their eating habits are so bad. That article yesterday on the girl who would only eat chicken nuggets only exasperated me further. I will be publishing two entries on solutions, but I want to vent some more about the problem first. What do we do with this paste of meat, gristle and bone? We add nitrites, salt, sugar and other ingredients, steam it into a paste, inside a skin and feed it to our children. If the disturbing nature of how it’s made don’t bother you, how about setting them up for the future? I have here a study result from Harvard School of Public Health that clearly links processed meat with greater risk for diabetes and heart disease. Do I even have to go into the evils of trans fats? It is another, man made Franken-fat, made by hydrogenating unsaturated fats to make them act like saturated fats. Manufacturers love them, as they don’t get rancid like real fat does. However, we’ve found out that they are worse than saturated fats when it comes to our arteries and heart. If you’d like to read more, this article, again from the Harvard School of Public Health is a good, easy read. So where is my set up leading? To our old friend Oscar Meyer, who has set himself up as a friend to mothers and children for decades now. I copied this off of their website, it is simply their nutrition label. Ingredients: WILD CHERRY WATER BEVERAGE WITH OTHER NATURAL FLAVOR: WATER, HIGH FRUCTOSE CORN SYRUP, CITRIC ACID, SUCRALOSE (SPLENDA(R) BRAND SWEETENER), NATURAL FLAVOR. BOLOGNA MADE WITH CHICKEN & PORK: MECHANICALLY SEPARATED CHICKEN, WATER, PORK, CORN SYRUP, MODIFIED FOOD STARCH, CONTAINS LESS THAN 2% OF SALT, POTASSIUM LACTATE, SODIUM PHOSPHATES, SODIUM DIACETATE, SODIUM ASCORBATE, FLAVOR, SODIUM NITRITE, EXTRACTIVES OF PAPRIKA, POTASSIUM PHOSPHATE, SUGAR, POTASSIUM CHLORIDE. PASTEURIZED PREPARED AMERICAN CHEESE PRODUCT: MILK, WATER, MILKFAT, MILK PROTEIN CONCENTRATE, WHEY, WHEY PROTEIN CONCENTRATE, CONTAINS LESS THAN 2% OF SODIUM CITRATE, SALT, LACTIC ACID, SORBIC ACID AS A PRESERVATIVE, CHEESE CULTURE, ENZYMES, OLEORESIN PAPRIKA (COLOR), ANNATTO (COLOR), WITH STARCH ADDED FOR SLICE SEPARATION. CONTAINS: MILK. CRACKERS: UNBLEACHED ENRICHED FLOUR (WHEAT FLOUR, NIACIN, REDUCED IRON, THIAMINE MONONITRATE [VITAMIN B1], RIBOFLAVIN [VITAMIN B2], FOLIC ACID), WHOLE GRAIN WHEAT FLOUR, SOYBEAN OIL, SUGAR, PARTIALLY HYDROGENATED COTTONSEED OIL, SALT, LEAVENING (BAKING SODA AND/OR CALCIUM PHOSPHATE), WHEY (FROM MILK), SOY LECITHIN, NATURAL FLAVOR. CONTAINS: WHEAT, MILK, SOY. ARTIFICIALLY FLAVORED CANDY: SUGAR, INVERT SUGAR, CORN SYRUP, MODIFIED CORN STARCH, TARTARIC ACID, CITRIC ACID, NATURAL AND ARTIFICIAL FLAVORING, YELLOW 6, RED 40, YELLOW 5 AND BLUE 1. I italicized all the ingredients I would have a problem with. I skipped some that I wasn’t sure about, I leave it to you to decide. Do you want you children eating trans fats, mechanically separated chicken, four chemical food colors, artificial flavors that are chemicals, starch, salt, sugar, nitrites and high fructose corn syrup? Why do we do this? We should be giving our children our best, not our worst! I dare you to walk around a supermarket. Pick up any product aimed at children. How much sugar is in it? How many food colors? Does it have artificial flavors? Hydrogenated oil? What real food products are in it? How far is it from something recognizable as food? Gogurt? Why aren’t we just feeding them yogurt? Plain, add your own real fruit yogurt. Next week I’ll come up with some suggestions for alternatives to mass marketed children’s meals and snacks. In the meantime, read the labels. If you don’t know what the words in the ingredients mean, think twice about feeding it to your children. Avoid hydrogenated oils, make “crackers” out of flat bread or pita bread toasted in the oven. Make meatballs, bake them in the oven, freeze them individually so you can thaw and serve them as needed. Then you know what your child is getting in his meat. Remember, if you can leave a food on a shelf indefinitely without it spoiling, it is full of chemicals to make it so. Live to dye another day. Who can resist these puns? I just wanted to add the pictures. 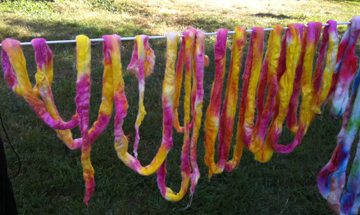 Dying is so much fun, and so easy, at least for protein fibers like wool. I would recommend doing it outside, in the summer. Do not do as I do-WEAR GLOVES. Especially if other people will see your hands. Good old Wally-World (WalMart) sells dye for cotton, linen, silk and other natural non-protein fibers(cellulose). Tulip brand. I know, you are going to yell at me and tell me that silk is a protein fiber. I know, the package says it dyes silk, what can I say? Here is the cake dye pot. 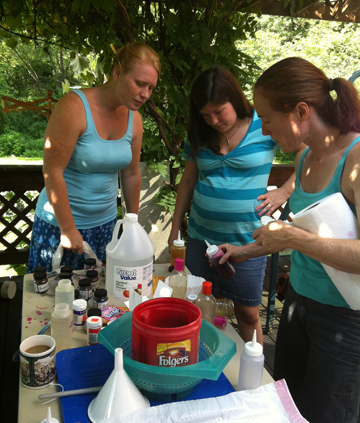 Wilson’s icing dye- great stuff. Cheryl took such a good picture, you can see how it didn’t take evenly. The above were all kettle dyed. 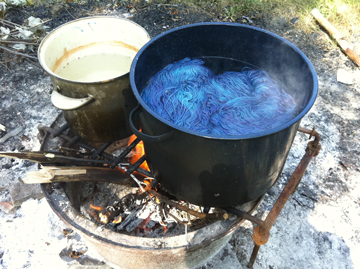 The ones in the foreground had the blue dissolved first, the skeins put in, then using a butter knife, other colors were put in the dye pot and lightly swished. 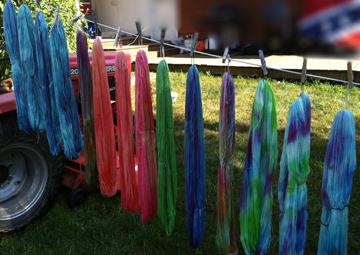 Here is more traditional “space-dying”, where you dissolve you dye in hot water in dispensers, then strategically place the color where you want on the fiber that has been soaked in vinegar/ water. That is what I am demonstrating in the top picture. That’s all for now. I have to get a sweater done by Thursday. Thank goodness for a knitting machine. We are supposed to go horseback riding tonight, leaving me about 4 hours before Thursday, although if I really get crunched, I can take it to work and try and finish it on my breaks.